The Fatih Mosque is the sanctuary of the imperial complex built by Mehmed II to commemorate his conquest of Constantinople in 1453. It stands at the center of an expansive precinct that was entered through gates along the northern and southern walls and between madrasa (medrese) buildings that enclose the space to the east and the west. The architect of the mosque, as of the complex, is Atik Sinan (Old Sinan). Built between 1463 and 1470, the complex was restored by Bayezid I following an earthquake in 1509. The dome of the mosque collapsed in the 1766 earthquake and was reconstructed entirely in 1771. Our knowledge of the original mosque is limited to the accounts and sketches of travelers and chroniclers. According to these sources, the mosque had large entry hall with a tall dome supported by a semi-dome of equal radius over the mihrab and three colossal arches on the remaining three sides. This ensemble was flanked by three domed bays to the east and west and was entered through an arcaded courtyard to the north. Three wings of the original courtyard have remained to our day. The new mosque by Mustafa III has also incorporated the portal, the mihrab and the lower shafts of the minarets belonging to the original structure. The reconstruction by head-architect Mehmed Tahir was realized in the appropriate historic style, distinct from the rococo fashion seen in the contemporary mosques of Nuruosmaniye and Laleli. The form, however, was altered for the most part. The new mosque is slightly wider than the old one and has a tall central dome held by semi-domes on all four sides in ways that resemble the classical mosques of the sixteenth century. Four small domes complete the corners of the pyramid-like space. The plan, oriented 32 degrees east of south, is wider than it is deep and is equal in size to the open courtyard that precedes the mosque. The courtyard has one main and two side entrances. The main portal is located to the northwest, on axis with the entry to the mosque and the ablution fountain at the center of the courtyard. It is adorned with seven rows of stalactites inside three arches. The side entrances, with cascading steps on the outside, are located where the courtyard gallery meets the taller portico of the mosque. Windows placed low in each bay of the gallery creates visual connection between the mosque courtyard and the lower grounds. The gallery columns are carved of granite, white marble and green stone. The tympana of each window is adorned with Koranic inscriptions in white and green marble on the precinct side. Ceramic tiles other inscriptions decorate the tympana of two windows inside the mosque portico. The mosque entrance is marked by the raised dome and the green and white voussoirs of the central bay of portico. The muqarnas portal, maintained from the original structure, has been transformed on the interior with the addition of a balcony above its ribbed semi-vault and a raised terrace (mahfil) with side bays at its front. The central dome, supported by two elephant piers and two porphyry columns in the old structure, is carried on four large piers that section the interior space. The decorative painting of the interior reflects the baroque influence on 18th century Ottoman architecture. While rebuilding the mosque, the side walls were taken in to accommodate sheltered terraces on either side that have rows of faucets for ablution. A ramp was built on the eastern corner adjoining the marble royal lodge (hünkar mahfili) to allow the sultan enter on his horse. 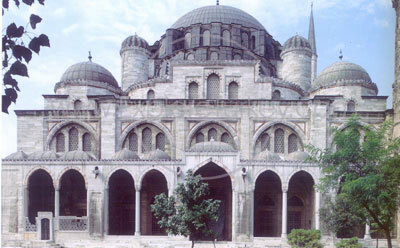 The original Fatih Mosque had two minarets with single balconies. They were rebuilt with two minarets after the earthquake, incorporating the old foundations and the lower shafts. The minarets were refurbished in empire style during the 19th century; their stone spires were replaced by lead spires in 1965, with no alteration to the balconies. The mosque is currently under restoration to repair damage caused by the earthquake on August 18, 1999.